Les inscriptions se font uniquement via ce formulaire, jusqu’au 5 Juin 2017. 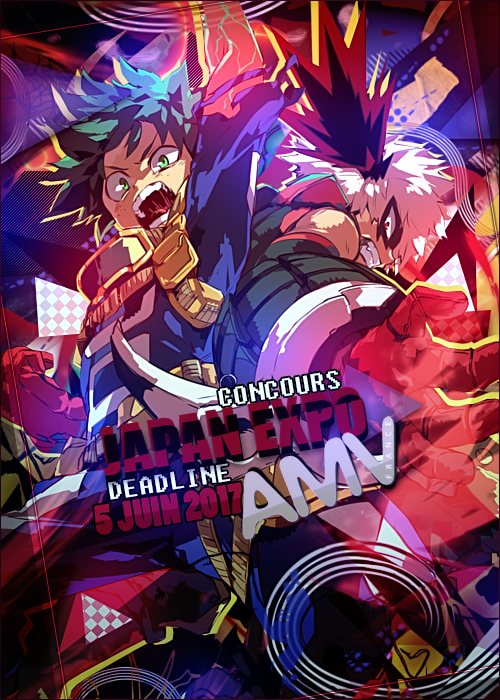 We teased you, you dreamed of it, we worked on it, you asked for it and here it is : Japan Expo AMV contest 2017 coordinated by AMV-France. Present in the convention each year, the association aims for its contest to be THE most memorable event of the year. To achieve it, we expect for a ton of videos thanks to experienced editors and ambitious outsiders entering in the contest ! - Your AMV must be sent before June 5th, 2017, 11.59pm (GMT +2 Paris). - The contest is based on exclusivity: your AMV shouldn’t be found online before the convention screening (on July 8th, 2017). Be it through streaming or download. Registrations can only be made through this formular, until June 5th, 2017. - This year, you must show clearly the title of the contest: Japan Expo 2017. For this purpose, we provide a [b]logo, and it is MANDATORY to use it. - Both finalists and “coups de cœur” will be revealed by pack, without distinction, a dozen of days before the start of the convention (6th July 2016). - Finalists will be screened on giant screen on Saturday 8th (not ranked) and on Sunday 9th July 2017 (ranked). - Complete results will be available on the AMV France website, soon after the convention (9th July 2017). - El contest es exclusivo, esto significa que tu AMV no puede ser publicado en ningun lugar antes de la convencion (6 de Julio). El registro puede ser llevarse acabo llenando ESTA forula, hasta el 5 de junio. -Este año deberas mostrar con claridad el titulo del contest: Japan expo 2017. Con este proposito, te damos el logo aunque no es estricto usarlo. - La duración del video no puede ser menor que 60 segundos. Este año los ganadores recibiran increibles figuras, elegidas por su calidad pero en la medida que sea posible, adaptados a cada ganador! Si tu llegas al top 3 y ganas la elección del público conseguiras dos figuras! Si el ganador no esta presente en la convención los premios le serán enviados. Para alguna otra pregunta, contactar a kaohmin: kaohmin@amv-france.com.